The undulating shape of the Trinity Table base is achieved by stacking multiple laminations of plywood core, which are then shaped and contoured into a free-form design. The clear delta shaped glass top ensures that the sculptural silhouette of the base remains visible at all times. The woods used in the creation of the Trinity Table design are typically FSC certified as being derived from sustainable sources. 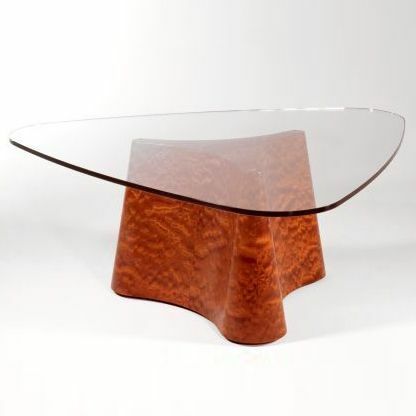 The specifications of the Trinity Table are also consistent with the sustainability standards set out by the U.S. Green Building Council's stringent LEED (Leadership in Energy and Environmental Design) program, namely the MR-7 Credit for certified wood use; the EQ Credit 4.1 for Low Emitting Solvents and Materials; and the EQ Credit 4.2 for Low Emitting Materials, Paints and Coatings.